The recognition of support and resistance levels on a stock chart is an integral part of technical analysis. The concepts are simple but very important. “Support” is a level on a stock chart that represents a zone where buyers won’t allow the price to go any lower. Of course the price can always go lower, there are no absolute certainties in the stock market, but the probabilities aren’t in favor of the price breaking below a support level. If a support level is broken then perhaps the trend is changing to the downside. Keep in mind that the markets work on “supply” and “demand”. When demand exceeds supply, prices go up. When supply exceeds demand, prices go down. So, support levels occur where buyers are stronger than sellers. The stock chart above displays a support level at approximately $1.25. The breakdown below that support level that occurred in May 2010 resulted in the stock price moving lower. “Resistance” is a level on a stock chart where prices have trouble breaking through. If the stock does eventually break through a resistance level it’s a bullish sign. In the stock chart above the resistance level is located at approximately $11. The breakout above this resistance lead to a profitable rally. 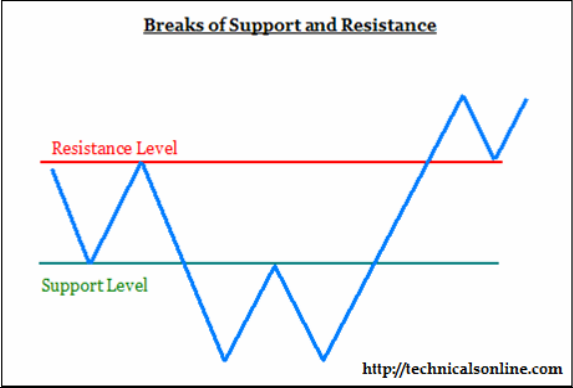 What makes a support or resistance level valid? The more times a support or resistance line is touched by price, the more valid it is. Also, the longer the level has existed, the more valid it is. Breakouts above valid resistance levels are significant events. They are a bullish sign indicating the likelihood of the stock price moving higher. Similarly, breakdowns below support levels are significant events. They are a bearish sign indicating the likelihood of the stock price moving lower. How can a knowledge of support and resistance levels benefit you as a trader? If you can identify valid support and resistance levels on a stock chart, you are able to make trading decisions based on better than average probabilities. 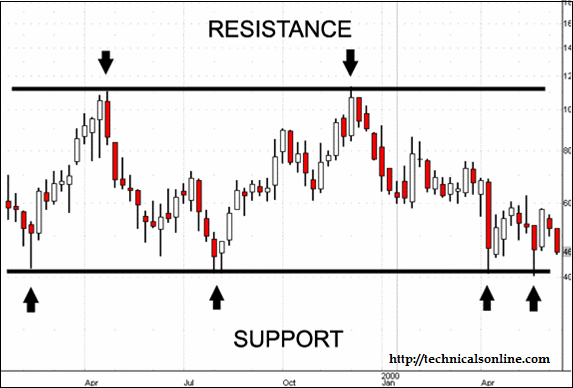 Careful analysis of any stock chart will reveal that support and resistance levels define the trend. A trend is made up of peaks and troughs, of which support and resistance levels form an integral part. The identification of support and resistance levels when studied alongside the dominant trend of a stock can give you a valuable clue as to the stock’s likely next movements.